Year of the glutamate receptor. A few months ago we wrote a post about the triplet of Nature Genetics publications that established GRIN2A mutations as a cause of disorders within the epilepsy aphasia spectrum. GRIN2A codes for the NR2A subunit of the NMDA receptor, one of the most prominent neurotransmitter receptors in the Central Nervous System. Now, a recent paper in the Annals of Neurology reports mutations in the GRIN2B subunit as a cause of Infantile Spasms. Interestingly, the functional consequences of these mutations are completely different from GRIN2A-related epilepsies. The two faces of GRIN2B. NMDA receptors are one of the main receptors for glutamate, the main excitatory neurotransmitter in the CNS. Mutations in glutamate receptors as a cause for neurodevelopmental disease were only discovered recently. The most frequent phenotype associated with mutations in glutamate receptors is intellectual disability or autism. Epilepsy as a phenotype of loss-of-function mutations in GRIN2A came as a big surprise and is still counterintuitive; it is simply not clear why the loss of an excitatory receptor would result in hyperexcitability. Mutations in GRIN2B have previously also been described in autism and intellectual disability. These mutations were usually loss-of-function mutations. The recent publication by Lemke and colleagues now finds mutations in GRIN2B in patients with epileptic encephalopathy – the mutations result in increased calcium influx, providing a molecular substrate for hyperexcitability. The NMDA receptor. The NMDA receptor is tetrameric, i.e. it consists of four subunits. These include two NR1 and two NR2 subunits. NR2A (GRIN2A) and NR2B (GRIN2B) are the two main NR2 subunits. NR2B is replaced by NR2A during development, providing an explanation for the age-dependence of NR2A and NR2B-associated epilepsies. Mutations in NR2B cause various phenotypes depending on the location of the mutation. The more severe mutations are located in the re-entrant loop. Mutations resulting in milder phenotypes are located in the ligand binding domain (LBD). The N-terminal domain (NTD) is extracellular, the C-terminal domain (CTD) of the NR2 receptor is intracellular. Sequence variation in human control databases resulting in amino acid changes is usually found in the long C-terminus, which is important for keeping the receptor in place in the postsynapse. Phenotypes 2B. Lemke and collaborators identify de novo GRIN2B mutations in two patients with Infantile Spasms and a patient with intellectual disability and focal epilepsy starting at the age of nine years. An additional patient with Infantile Spasms carried an inherited splice variant of GRIN2B, suggesting that this variant is more likely to be a risk variant than a causative mutation. In addition, one further patient with Lennox-Gastaut Syndrome (LGS) and a de novo GRIN2B was previously described in the Epi4K cohort. Collectively, these findings clearly suggest that GRIN2B mutations are a rare, but identifiable cause of epileptic encephalopathies – another gene crossing the border from candidate to established epilepsy gene. Genotype/phenotype. There is some genetic variation seen in GRIN2B in control populations, but this variability appears to limited to the C-terminus, sparing the transmembrane regions and glutamate binding sites. This basically suggests that the long intracellular “tail” of the protein may tolerate changes in the amino acid sequence. This is in contrast to other domains of the protein, which require the precise sequence of amino acids for proper channel function. The mutations observed in GRIN2B appear to support this theory – the Epi4K LGS patient and the patient with ID and focal epilepsy had mutations in the glutamate-binding site. In contrast, both patients with Infantile Spasms had mutations in the pore region – the effect of mutations in such transmembrane regions would be predicted to be much more severe. This hypothesis is supported by the increased calcium influx of these mutations. Precision therapy. 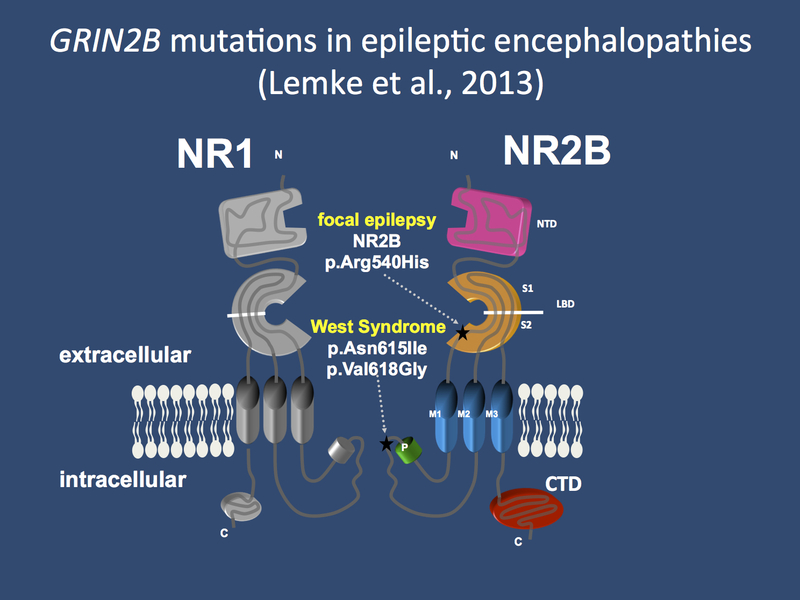 The identification of activating mutations in GRIN2B provides an important example why it is important to identify the genetic cause in patients with epileptic encephalopathies; NR2B, the protein encoded by GRIN2B, is potentially targetable and modifiable through already existing compounds or drugs. One example is the available NMDA receptor antagonist memantine, which represents an interesting option for patients carrying activating mutations in this gene. While we are not yet in a position to translate genetic findings into novel therapies, the growing success of gene identification in epileptic encephalopathies will provide the basis for developing treatment options based on molecular findings. This entry was posted in 2013, Bioinformatics, Epileptic encephalopathy, EuroEPINOMICS, Papers and tagged focal epilepsy, glutamate, GRIN2A, GRIN2B, Infantile Spasms, intellectual disability, neurotransmitter, NMDA receptor, NR1, NR2A, NR2B, transmembrane domain. Bookmark the permalink.